The North Central Texas Council of Governments (NCTCOG) maintains and updates an inventory of closed and abandoned landfills located within the North Central Texas region. Southwest Texas State University, under a contract with the Texas Commission on Environmental Quality (TCEQ), and in cooperation with the 24 regional Council of Governments across the state of Texas, completed an initial statewide identification of closed and abandoned landfills. 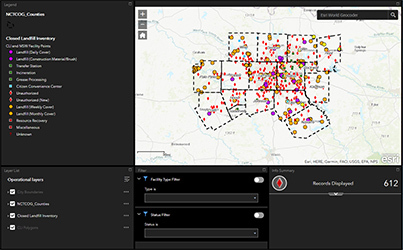 A total of 623 sites are located within the North Central Texas region. Of these sites, 136 were permitted by the state and 487 were unauthorized, and are now considered abandoned. Over the past several years, NCTCOG further researched each of these sites and when possible, obtained more detailed information about the location, current land use, and ownership. In those cases where exact landfill boundaries were identified, the county deed records office and the current landowners were notified of the prior land use of the property for public health and safety reasons. This information, as well as site maps, are accessible here as both a county-by-county list and searchable map. If you have information on or questions regarding any of these sites, please contact the NCTCOG Materials Management Team by phone at 817-695-9210, or by email, at EandD@nctcog.org.